The beacon transmitters are now using a new transmitter chip. This works better, is smaller and lighter. It also works better with the Baofeng UV-5R receiver. Important Note: Tune the Baofeng UV-5R to 433.915 MHz to 433.925 MHz. The earlier beacons worked best with the UV-5R tuned to approximately 433.835 MHz. To narrow in on the best frequency, tune the UV-5R or scanner to 433.920 MHz. With the beacon activated and on the ground move away while adjusting the receiver tuning up and down. As the signal gets weaker finding the center frequency is easier. Note: Coiling the antenna will reduce the beacon range and make tuning easier. The current version of the standard FPV and multirotor trackers are even better suited to use with LRS radio RC systems. We have reduced the duty cycle and removed the periodic carrier transmission from all versions. The current version can also be tracked using a standard radio scanner tuned to 433.920 MHz (or as near as possible; 433.925). This is due to the switch some time back to a different radio transmitter module. Long range is still better with a matching receiver, but we have tested with the Baofeng UV-5R walkie-talkie and Uniden UBC57XLT and Uniden UBC73XLT radio scanners. You still need a yagi antenna for best range. The older Uniden UBC57XLT is easier to use but has a odd-ball antenna connector (I converted mine to BNC, a few years back : See Here). The newer Uniden UBC73XLT has a BNC antenna connector but the user interface is almost impossible to use; I don’t know what the Uniden designer was thinking. This is a RF tracking transmitter designed for RC planes. Sometimes called a lost model locator or lost model finder. It is small and light weight, has it’s own internal battery, operates at 433 MHz and transmits for weeks. It only transmits after the RC model is lost and is compatible with 433MHz LRS RC. Multi-rotor Version: We have added a version of the tracker transmitter better suited to multirotor models (often referred to as drones). No wiring connection to the model is required. Simple arm disarm and transmission begins after 30 minutes if not disarmed. Product link. We also offer a 15 minute version. Product Link. The original tracker was designed with FPV and larger gliders in mind. These are the models that get a bit further away or higher and if control is lost can easily land many miles or kilometers away. It also has other uses, such as radio fox hunting. The antenna wire and a small buzzer at one end. The RC connection and enable/disable jumper at the other end. Yes, the jumper can be extended to a more convenient location on the model. Referred to as lost model locators or lost model finders or alarms, these are often buzzers that monitor a servo channel and emit a loud alarm noise when the transmitter is out of range or switched off. These are great if you loose the model in a field of corn or long grass within easy walking distance; and assuming the battery and alarm are still plugged in. These are cheap and a good idea. There are also a couple of locator devices available that use 2.4GHz radio linking tags with a small receiver. These are also short range devices. At ground level, operating at 2.4GHz and having minimal antennas, performance is very limited. Considering the short range, I suggest the audible alarm as a better choice for RC model location. Our Lost Model Tracker goes much further. It allows you to find the model almost anywhere, in any condition, even if the model battery is ejected in the crash or long since flat. If you loose a model in some unexpected wind, a thermal or simply a radio problem and it flies away. The tracker will allow you to track it down. Ham Radio enthusiasts do this with small transmitters, receivers and directional antennas for fun, and it is a lot of fun. They call it radio fox hunting. This is the original version. It was designed with FPV and longer range flying in mind; where it may take some time to locate the model due to distance or terrain. The transmitter connects to a active servo lead and monitors the 5V power and PPM signal to know when the model is powered and under control. If control is lost for longer than about 10 minutes (current version = 30 minutes) the transmitter starts sending out a beacon signal that can be tracked using the matching receiver or a suitable 433MHz AM radio scanner and antenna. A jumper is used to enable the tracker and disable it on completion of a successful flight. The jumper is on a string or ribbon and not easy to forget before take off. The tracker on transmits after the model has been lost. With normal flying, the tracker will not transmit. The transmitter has it’s own internal battery that should lasts well over a year on standby and provide at least 2 weeks of active tracking time. This is the newer version. It is designed with multirotors in mind; where simple installation and light weight is important and the lost model is likely not too far away but may still take a several days to recover. Before flying, remove the jumper link to arm the tracker. Beacon transmission will begin about 30 minutes later. 30 minutes should be plenty of time for a multirotor flight. After landing, replace the jumper to disarm the tracker. This version has a higher beacon transmission rate. This makes it a bit easier to track, but increases battery drain and reduces active transmission time; still a week or more. The 15 minute version may better suit flying near built-up areas where you want to track it down as soon as possible; before someone takes it home. Why not just use a GPS tracker? Some have suggested, just put a GPS tracker in the plane and you know where it is when it sends you a text message. The problem with this is that the plane has to crash in a location and position where it has a GPS fix and cell phone coverage. If the plane is the right way up, can get a GPS fix and can send a text to your phone then it’s not lost. If it can’t get a fix or doesn’t have a cellular signal, you’ve just lost the tracker as well as your plane. Even if you have a last known position that may be helpful. But from experience we know that a model plane can be impossible to find even when we are almost sure it is not more than 200 meters away. I have recently (early 2015) tested a selection of low cost GPS trackers. Although called “GPS trackers”, many do not contain a GPS receiver, but get position information from the cellular network. This is called LBS GSM localization (Location Based Service) and can have large errors. LBS may be even worse or not work in remote areas where there are few cell-sites. Some of these units do not directly text the location information to your phone, but send you a link to a web site that should show you. One of the units I tested sent a link to a dead Chinese web site that was no use at all. Another catch is that some of these devices make you sign up to a service. They take the location from the GPS tracker and pass it on, possibly for a fee, I refuse to sign up to these dodgy services. This is a slightly different version of the transmitter. It transmits a longer beep more often making it slightly easier to track. These differences make it more power hungry which does not suit RC lost model tracking where light weight and long life are more important. 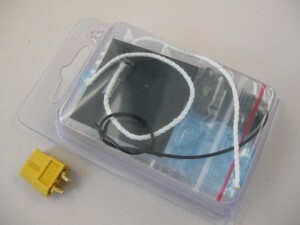 A Jumper is removed to enable the transmitter and replaced to disable it. The transmitter sequence begins as soon as the jumper is removed. Unless noted, the following Technical Information relates to the version for RC lost model tracking. NOTE: See the receiver page HERE for notes on testing the tracker transmitter and the receiver. The main design requirements were low power consumption for maximum search time, to be self contained and reasonably small and light weight. Low power consumption requires low transmit power and repetition rate but allows for a small internal battery that can keep the unit transmitting for weeks. Why the jumper to control it? We can configure the transmitter to auto-start when the model is powered on, but you still must use the jumper to disable it at the end of each flight. The problem is that the transmitter cannot tell the difference between a successful flight and a distant crash. Therefore, manual arm-disarm is required. The battery is a 3 volt CR2032 coin cell. Typically capacities are from 180mAh to 220mAh depending on manufacturer. We supply the 220mAh type. The battery should last, without loosing the model, for more than 2 years. To be safe and ensure plenty of capacity remaining in case it’s needed we recommend replacing the battery every 12 months or so. The standard tracker connects to a servo lead and monitors the 5V supply and the PPM signal. It draws some power from the 5V line whenever it can to extend it’s own battery life. But it does not charge it’s internal battery and the draw is very small. A total loss of the PPM signal will begin the beacon transmission sequence in about 5-minutes. A steady state PPM signal will begin the beacon transmission sequence in about 10-minutes. Once the beacon transmission sequence has started, it can only be stopped by replacing the jumper, or when the battery goes flat. The beacon transmissions are a very short dual pitch tone sequence. Every so often a longer duration marker tone is transmitted. Also periodically a longer unmodulated carrier only signal is transmitted which can be used by some radio scanners to tune in on the frequency which is 433.920 MHz. The transmission duration and repetition rate are a trade-off between ease of tracking and minimizing power use for maximum battery life. To replace the battery, cut off the heat-shrink covering and remove the old battery by releasing the metal clip. The battery may pop out or need a little help from a small pointy tool. These batteries vary slightly in size between manufacturers. Leave the battery out for a about a minute to allow the circuitry to discharge. It is possible to replace the battery without the tracker knowing it has been removed; and you won’t hear the little happy-tune. Replace the battery with a CR2032 lithium cell. Be sure to use a 220mAh or greater capacity. Some manufacturers make the CR2032 with capacities as low as 140mAh. While these will work, the standby time, tracking time and safety margins will be reduced. The + side of the battery faces out. When the battery is replaced there are a series of beeps and LED pulses, and the little happy-tune. Give the tracker a light tap (battery holder to bench) and check that the battery is seated and the claw/clip latched over the battery edge before sealing it up. Note: There are some cheap and very low capacity batteries available. Often sold on cards of assorted battery sizes. Replace the heat-shrink, carefully heating with a hear dryer or paint-stripper gun. Be careful not to get it too hot as the heat-shrink will split. The heat-shrink should be replaced providing protection and to keep the battery in place during a crash. The beacon is powered and monitoring as long as the battery is installed. When the battery is first inserted the LED and TX-carrier pulse 6 times. The beacon then waits about 10-sec before it starts monitoring for the RC 5V and PPM signal. The jumper on the tracker is used to disable the tracker; to tell it that it’s not required. To launch the plane: turn the RC transmitter on then connect the battery inside the plane as per normal. NOTE: switching on the transmitter last won’t upset the tracker but is not recommended for safety reasons. Next remove the jumper from the tracker to make it ready, There is a time delay of about 1-minute before it begins looking for the PPM signal which must be present for the tracker to fully arm (see note-1 below). Test the flight surfaces and RC operation as per normal and launch the plane. Upon landing: the plane (a planned/good landing), disconnect the battery in the plane first for best safety practice then replace the jumper to disable the tracker. Don’t forget to switch off your RC transmitter. Upon a fly-away: the tracker looses the varying servo ppm signal as the plane goes out of range or the transmitter is turned off. Tracker operation is initiated and waits 10 minutes (current model = 30 minutes) allowing time for a quick recovery and jumper replacement, before beginning the beacon transmission sequence. Upon locating the lost plane: replace the jumper to disable the tracker. If it has taken more than 24 hours to recover the plane, it is probably a good idea to fit a new CR2032 coin cell to the tracker before flying with it again. NOTE-1: The standard tracker needs to see the PPM signal for 1-minute at the start before it is fully armed. If the PPM signal stops before 1 minute, the tracker will go back to waiting for the signal to return. This allows the plane to be switched on for short periods for testing without triggering the tracker transmission. LED Indicator: When in standby (no 5V or PPM from the RC) there is a barely detectable flash every 5 seconds. After RC 5V power is detected but the jumper is still in place the LED flash is much brighter weather or not the PPM is present. When the jumper is removed the bright LED flash continues until the PPM monitoring begins (10 seconds). After triggering transmission begins and the LED flashes in time with the beacon transmissions. BEEPING: If you have the beeper audible; Generally, the only beeping you will hear is the rising tone beep when the jumper is removed (arming) and the falling tone when the jumper is replaced (disarming). The tracker will beep when 5V RC power is present and the jumper is removed. The next beep indicate it’s monitoring the PPM signal and will be fully armed and ready to fly. Any additional beeps after this indicate it has lost the PPM signal and has triggered the beacon transmission sequence. There is a small beep emitted with every second beacon transmission. To minimize battery drain, it’s not loud but it can be heard for up to 50 meters with no background noise. Around here: on a quiet night. NOTE: don’t sacrifice waterproof installation to make the beep audible outside the plane. Beacon Transmission Sequence: This can vary between versions and we may change it slightly with production batches to suit different situations. When triggered, the beacon transmission occurs every 2.5 seconds for the first 24 hours, then every 5 seconds for the next 48 hours, then every 10 seconds from then on. The question was recently asked: Can the tracker be used in built up areas? The answer is YES, but there are differences and the tracking techniques are a different. In a built up areas (cities or towns) tracking is more difficult. The range is reduced and the buildings block and reflect the signal. It depends on the area, and where the model lands in relation to nearby buildings etc. Direction finding could be very difficult. The best way would be to drive around listening for the signal and then reducing the receiver antenna efficiency as you get closer. Based on tests I’ve done, this would get you to within 50 meters. Before having to search manually. The tracker transmits at a low rate to maximize battery life for long distance forest or rural searches. In town, a more rapid transmission and a shorter battery life would be better. If you don’t find the model within a few days, chances are someone else has it. We can adjust a tracker to suit during assembly and may consider a standard variation.. The other problem with built up areas is the amount of general background radio noise. You are competing with many gadgets operating on the same band. A more rapid transmission will help. But you also need to know what the tracker sounds like to hear it among other transmissions. A saved audio recording would be a good idea as a memory refresher. The tracker must be protected and waterproofed. If the model flies off some distance it may be a day or two before you can get to it. The tracker needs to survive the impact and the time it takes you to reach the crash scene. It may rain or snow. With a carbon fibre fuselage, the antenna must be outside, and not taped to the fuselage. The antenna should be straight and clear of wiring and metal push-rods. The jumper can be extended to the outside of the model using an extension, like a servo extension lead. The servo connection to the tracker should come from an active channel such as aileron or elevator. The tracker monitors the 5V power and the PPM signal to the servo. Depending on your installation, a “Y” cable may be used. Another good trick is to connect it to a spare channel on your receiver and then mix the aileron or elevator over to the spare channel so that it follows. The tracker is just looking for movement and will begin transmitting if there is no movement for about 10 minutes. Make sure that your receiver freezes or stops providing the PPM signal to the tracker when signal is lost. Although probably no longer used, many old long-wire (35,40,72 MHz) receivers would output random noise when not receiving a valid RC signal. On foam models I like to embed the tracker into a wing and wire it in with a aileron servo. Wings often come off and largely survive even quite bad crashes, so the tracker should survive as well. You will need to replace the tracker battery after a couple of years of normal use. Does the tracker emit a loud beep or alarm for location? No, but there is a low volume intermittent beep. The tracker is more intended for locating models lost further away or nearby but difficult to get to; dense scrub or bush etc. Also where the crash may have disconnected the main battery, which happens often, or where it may take days to get to the model. Loud noises require a lot more power and higher voltage, which would make the tracker much larger and/or significantly reduce the run time. Will the tracker interfere with 433 MHz LRS RC? No. Not if you connect it to the receiver as recommended. The tracker does not transmit until after the model is missing. The tracker monitors the RC PPM signal and 5V servo power, and doesn’t begin transmitting until there’s a problem. Even if the tracker did begin transmitting mid flight, the duty cycle is so low that it will not interfere with a LRS radio system. Can long flights with very little PPM movement trigger the tracker? Yes. But there is a solution. Put the tracker on a spare RC channel and mix the control channels to provide more PPM movement. Or, if your transmitter is able, configure the channel to automatically move periodically. If you don’t have a spare RC channel, maybe you have LED lighting control and can configure it to automatically change the lighting state periodically. The tracker will begin sending if the PPM doesn’t change for about 8 minutes. Does it work with a Multirotor? See the multirotor version. 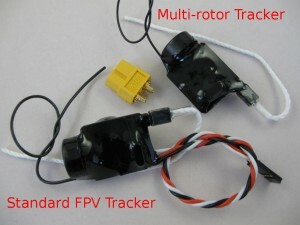 Yes, the standard tracker can be used with multirotors. Connect the tracker to any one of the ESC PPM signals. Keep the antenna as straight as possible and as far from carbon fibre and metalwork as possible. Does it work in cities or built up areas? Yes. But there are differences and limitations due to the buildings blocking and reflecting the signal. See the section above for more information. What are the tiny micro-clicks I can hear? This is normal. It is just the tracker waking up and checking its status then going back to sleep. In the dark you can see a LED blink through the heat-shrink with the click. It doesn’t significantly affect battery life, but the sleep period greatly improves battery life. What signal is transmitted? A low power OOK carrier signal (AM). A dual tone OOK modulation is used making the signal easier to hear. Can I use it with a radio scanner? Yes. Most of the cheap scanners default to FM on this band. These do work with the current trackers. Longer tracking ranges are achieved with the matching receiver that was designed for this system. Can I use a Orange LRS receiver? Although the radio module in the Orange LRS is capable of receiving the tracker signal, the code does not set it up to do so. It would require custom firmware. The other disadvantage is the lack of an audio output; which makes it usable over much longer ranges. Can it be re-tuned to another frequency The tracker operates on 433.925 MHz and it’s not practical to re-tune it. It transmits no more than 5mW of power. This frequency is within the small world-wide ISM band. Can it be used for tracking animals (pets) Our beacons are probably not well suited to locating lost pets. The problem is that it probably has to be active all the time (because you don’t know when your pet will go missing) and this greatly reduces battery life. That said, we have sold a couple for animal tracking. Is it legal in the UK Low Power Device 433 MHz (LPD433); part of the ITU region 1 ISM band. The 70cm Ham band includes a gap of 433.075 to 434.775 which is available for unlicensed use for devices like remote controls. SRDs = short range devices. The key requirements are that antennas must be fixed and power is limited to 10mW max. Why not use FM transmission? This tracker was designed specifically with long life on a small internal battery in mind. It worked out that the OOK/AM transmitter works very well and provides weeks of active tracking time. There is enough FM content that a FM receiver can be used. Longer range is achieved with a matching receiver. Why long duration operation? It was designed for FPV and RC flying that would put the model over difficult to access locations. Typically, dense forest and scrub. If the weather is bad, you can just come back next week and continue the search or scrub-cutting. Does the signal get louder, closer? Not really. As you get closer the signal gets clearer and sounds better. The receiver we supply is very sensitive and does quite a good job of levelling everything out. What is squelch? Squelch mutes the background noise. For distant tracking you have the squelch open and can hear all the noises. Closer in, the squelch can identify the tracker signal and cuts out the background noise. Why not convert it to FM? We have considered producing a FM Version. Battery life and therefore small size and weight are the biggest issues. The existing unit works very well. Fail-safe arming: For a while we included a sort of fail safe should the jumper be left on when flying (I’ve done this a few times). The tracker would cycle armed/disarmed and transmit with the jumper in place if 5V was applied to the servo lead; the model powered on. This feature has now been removed as standard (can be enabled during production if requested). Although it works, it makes tracker operation appear overly complex. Carrier only: Early versions of the tracker did periodically transmit a short carrier only signal to assist with tuning in receivers. This was found not to be useful and there was the possibility that the carrier could force a 433 MHz LRS radio system to fail-safe if the tracker was not connected to an active RC channel. This carrier transmission has been removed as of early 2015. Audible tick: With the jumper in place, when 5V is applied there should be a noticeably louder audible tick from the beeper about every 3-seconds. There is a small red LED that can just be seen through the covering that blinks with the ticks. Starting from scratch, no servo power applied and the jumper on, the tracker should shut down (may take 10 seconds). Then remove the jumper. You should soon hear the positive tune. Replacing the jumper you should soon hear the negative tune. With the jumper off and without applying 5V power, the tracker should not go any further than the positive tune. Applying 5V power now and the tick and LED pulse become noticeable. After a minute or so the tracker will fully arm with a short beep. To stop it now you need to replace the jumper and remove the 5V power. The tracker is always powered on. It is possible to do a complete cold reset but this should not be necessary. To do a complete reset you need to cut the heat-shrink covering off and remove the battery. Leave it out for a several minutes to ensure full discharge before putting it back in. Check operation before re-covering. If your tracker has a soldered in battery rather than a battery holder, you can momentarily short the battery. Make it a very quick short, although normally not the best way to treat a battery, the 2032 cell has such a high internal resistance that there is no danger.